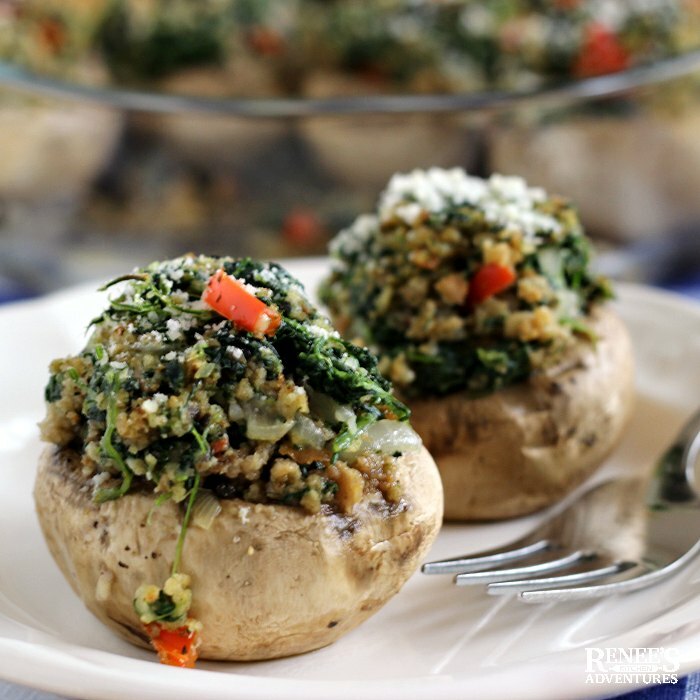 Looking for a healthy vegetarian stuffed mushroom recipe that's full of flavor, easy to make, and can be prepped ahead of time, then baked right before serving? You've come to the right place! 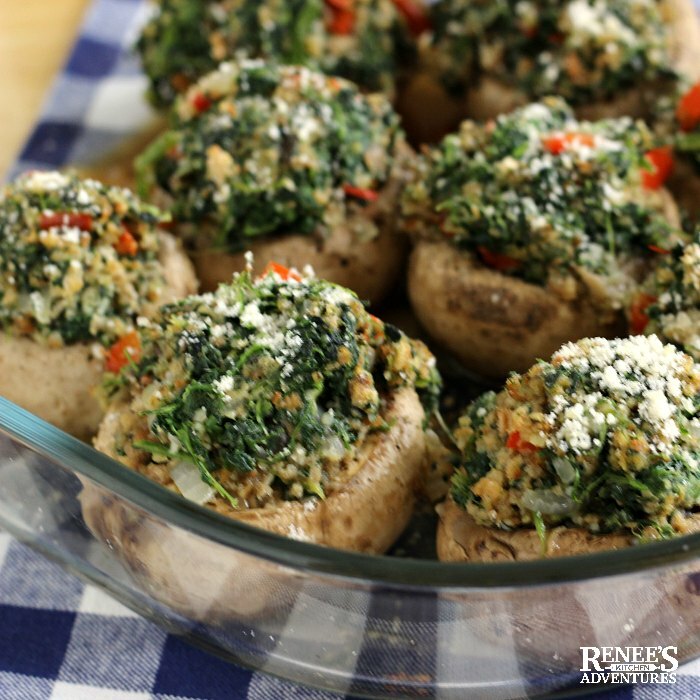 These Easy Vegetarian Stuffed Mushrooms are made with mushrooms, spinach, onion, sweet red pepper, zesty seasonings, Parmesan cheese, and bread crumbs. Then, they're topped with an extra sprinkle of Parmesan cheese and baked until tender for a great healthy appetizer or side dish for any occasion! What can I say? We're a family of mushroom lovers! We love them in this Mushroom Pork Chops recipe and in this recipe for Easy Mushroom Rice Pilaf. You will almost always find some variety of mushroom in my refrigerator at any given time! We love mushrooms in all sorts of recipes, but our favorite way to eat mushrooms is when they're stuffed! mushroom recipe, I happen to think this is the best stuffed mushroom recipe around! Well, she doesn't eat mushrooms. I think that's her loss. Mushrooms are delicious! And, if you've read this far...you must agree! Easy Stuffed Mushroom recipe not just for vegetarians! I've been making these Easy Vegetarian Stuffed Mushrooms recipe for years now. They're always a hit! I make it as a side dish for meals and I make it for holidays. Easy Vegetarian Stuffed Mushrooms are one of my favorite vegetarian recipes. There's never any leftovers when I put them out at Thanksgiving and Christmas meals. This easy stuffed mushroom recipe is perfect for Thanksgiving and Christmas because the button mushrooms can be stuffed ahead of time, refrigerated, and then baked off right before serving. They also reheat well. 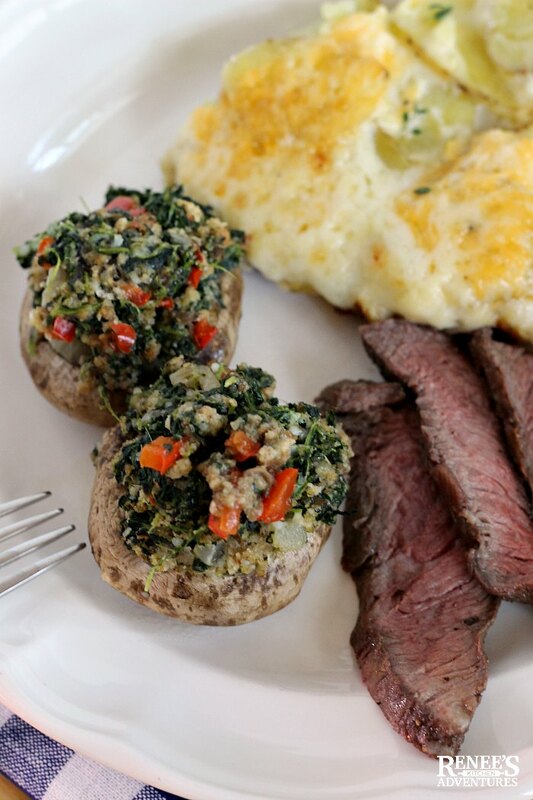 The inspiration for this simple stuffed mushroom recipe originally came from Weight Watchers. 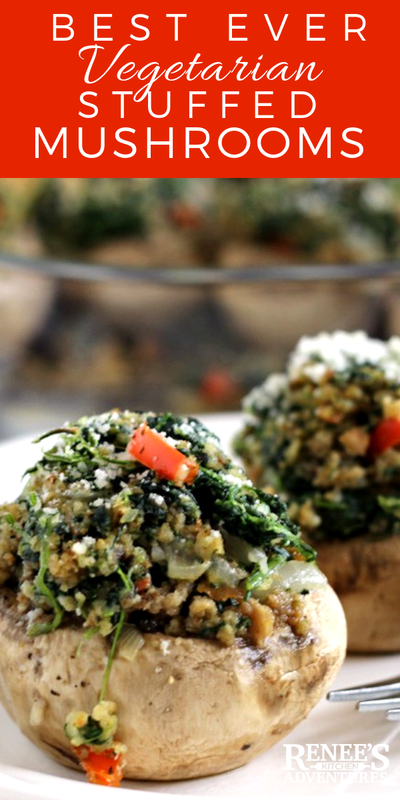 Not only is this baked stuffed mushroom recipe delicious, but it's also healthy! That makes it a win-win in my book. Can I use this stuffing to make vegetarian stuffed portobello mushrooms? Yes! You can easily use this stuffing in portobello mushrooms. (Or use your portobello mushrooms to make these low carb Portobello Mushroom Pizzas!) While this recipe calls for button mushrooms, stuffing portobello mushrooms with this vegetarian stuffing would make a great main dish or even a hearty side dish! I would recommend removing the "gills" of the portobello mushrooms before stuffing them though, otherwise the stuffing may get too wet. 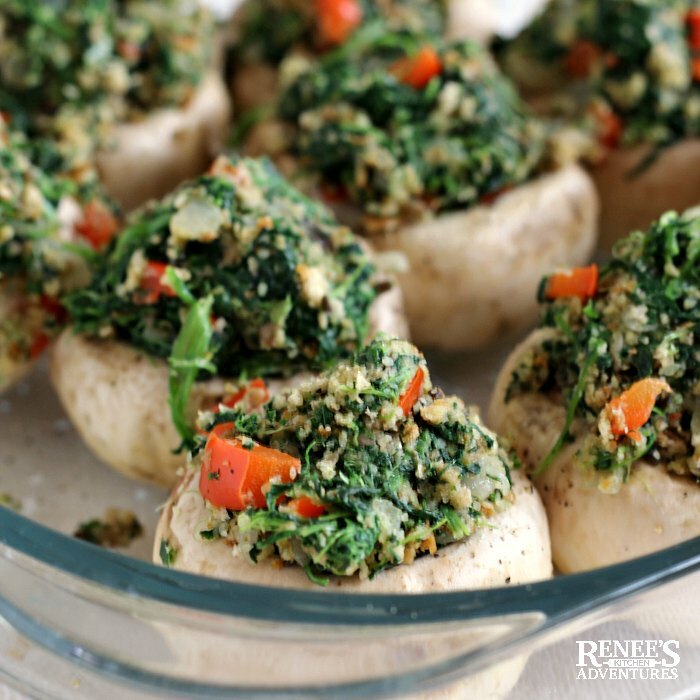 Easy Vegetarian Stuffed mushrooms are made with mushrooms, spinach, onion, sweet red pepper, zesty seasonings, Parmesan cheese, and bread crumbs. Then, they're topped with an extra sprinkle of Parmesan cheese and baked until tender for a great appetizer or side dish for any occasion! Preheat oven to 350 degrees F. (If prepping ahead of time, do not preheat oven until you are ready to bake the mushrooms. Lightly coat a 9 x 13" casserole with cooking spray. Clean mushrooms with a damp paper towel. Remove stems from caps and finely chop. (I used a food processor) Set aside. Place caps, with hole from stem side up, in prepared casserole dish. Season caps with salt and pepper. Heat oil in a large skillet over med-high heat. Saute chopped mushroom stems, onion, red pepper, and spinach until the vegetables are tender, about 5 minutes. Remove skillet from heat and stir in bread crumbs and creole/Cajun seasoning and Parmesan cheese until well combined. Taste the mixture and add salt and pepper as needed. Stuff each mushroom cap with approximately 2 TBS of filling. Sprinkle with more grated Parmesan cheese. Cover dish with foil. (You may refrigerate the stuffed mushrooms at this time, then bake off right before serving.) Before baking, add about a TBS water to bottom of pan and seal foil back up tightly. Bake for about 15 - 20 minutes or until the mushrooms are soft. Serve warm. I am a fan of stuffed mushrooms also. I was anxious to see what the filling was. I may make these and sub crushed pork rinds for the bread crumbs so I can make it Keto! These look SO GOOD! I think pork rinds would be a great substitute! let me know what you think when you make them. I love mushrooms and this recipe looks so dang delicious! The great thing about a recipe like this is that it is so easy to switch out an ingredient here or there if you don't have them or have dietary needs.